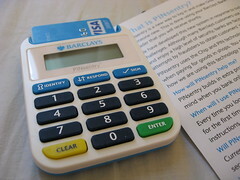 My PinSentry device from Barclays arrived today. I really think its a good move by Barclays to introduce this two-factor authentication. The only trouble with this type of security is that it doesn’t protect against man in the middle attacks, so its still important to check that the site you are visiting has the https:// in the address bar. It looks like a cheap calculator from the early 80’s. My NatWest one looks a lot more snazzy. I was about to take a picture but I seem to have lost it already. Previous Previous post: Christmas Eve at the office.